At the end of last week, I wrote about all of the amazing soccer that would be on tap during this past weekend. Boy was i right. But, I’m not writing about any of the World Cup qualifiers today. For a change — and much to the delight of those of you who have shared with me that they would like to see more domestic coverage on the blog — the most exciting football of the weekend actually came from MLS. First up: the Western Conference Finals between LA and Houston. Despite the pitch going dark twice thanks to “rolling-blackouts from the local power company” (Which if that was the case, why were the sponsor boards still up and running while the flood lights were out? Or the cameras that were still running, etc. ), the game was extremely entertaining on the pitch. Quality play was abundant, despite Landon Donovan and David Beckham having relatively quiet games. 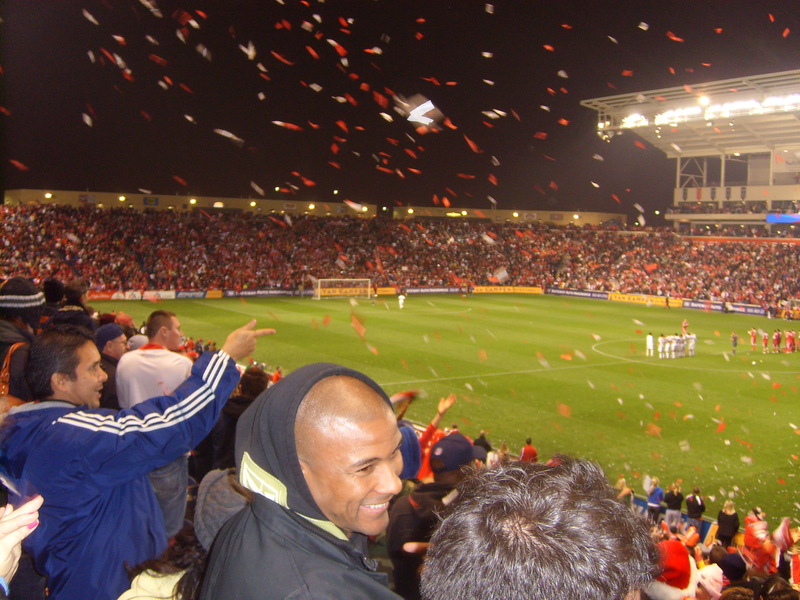 Then on saturday was the MLS Eastern Conference final played at Chicago’s Toyota Park. My fiancée and I made the five-hour drive to meet up with the elder Rolfe brother and his soon-to-be-wife to watch the younger Rolfe’s last home game ever in MLS. We enjoyed a whirlwind Chicago experience unlike any I’ve ever had before… most of which I can write about, while some is better left to be told in confidence. First off, I have to admit that I’ve probably been a little hard on MLS. I know that I’m one of those traitorous, Eurosnob Americans who ardently follows the major European leagues much more closely than his own domestic one. The on-field product has always been my primary justification for this choice, and rightfully so. If we’re comparing the level of play of MLS to say the Premiership or La Liga, it would be asinine of anyone to argue that MLS is superior to England or Spain’s top flights. And up until this weekend, I would have also said that the game day experience offered by the European clubs crushes the experience offered by MLS. I’ve probably been to 50+ MLS games over the years, and though the fan experience has gradually gotten better with time, the limited experiences I’ve had attending European games blows even my best MLS experiences out of the water. That’s not to say that there aren’t any excellent fan bases supporting our MLS side, though. I’m familiar with a few of the members of Columbus’ Crew Supporters Union, who attend every home game and several away matches. The Galaxy’s main supporters group, the LA Riot Squad gained considerable press time for riding Beckham hard at the beginning of the season. And I’ve heard and seen much about Seattle and Toronto’s energetic fan bases. An impressive bunch really. I’m even a fan of the flares, despite MLS frowning upon their usage. And if there’s one thing about Saturday’s Conference Final against Real Salt Lake that I need to tell you, it’s this: Toyota Park looked like it was filled to its brim by Section 8. There wasn’t a spare seat in the house, and every area that accommodated standing was lined shoulder to shoulder and two-deep with fans. The Section 8 Ultras were lighting their flares again. Kids and their parents were decked out in Fire apparel. I even saw a guy wearing an entire fireman’s uniform… heavy garb, helmet and all! The atmosphere was electric and truly a privilege to take in first hand. By the time the game came to penalties, it was all pins and needles in the crowd. Deafening noise every time RSL lined up to take a kick, followed by uneasy silence for every Fire attempt. And you know what? The on-pitch product built upon the crowd’s monster energy levels. Both teams had their moments where they dominated possession, slinging the ball around and connecting 10-15 passes in succession. Real Salt Lake’s Kyle Beckerman — in all his dread-locked hippy-style glory — played magnificently, begging me to wonder why Bob Bradley hasn’t called him in to the national side more often. Chris Rolfe showed why he’s making a big money move to Denmark, distributing and attacking with style and flair. Chicago’s Jon Busch made some world class saves. Hell, even Blanco seemed eager to do more than stand around and take dives… I even saw him sprint a few times! Unfortunately for us and the home crowd, the Fire ended up falling short on penalties (I hate penalties… I’d much rather let the teams play endless overtimes until someone can find the back of the net). Though the disappointment was hard to overcome, it doesn’t change my opinion of the game and the overall experience. Saturday night was pure evidence that MLS has come a long, long way since the league’s first season in 1996. [Mostly] Gone are the days of playing in front of two-thirds empty, cavernous football stadiums. Gone are the days of contracting debt-ridden franchises due to poor ticket sales. Instead, we have a thriving, growing league supported by a loyal and energetic fan base. We have an improving player pool, perfectly capable of sustaining the league and “graduating” it’s best to the European ranks. I mean, you know a league has made it when you can buy fake jerseys for its teams… I saw at least two knock-off Fire shirts and one Beckham kit too. It’s a little unbelievable how far we have come. This event was a perception-changing experience. Before this weekend, MLS was nothing more than a summer time fill-in while Europe was taking its summer holiday. And while I knew that the level of play had drastically improved, I didn’t realize that it had improved this much. I didn’t quite realize that fans were this involved. And because of that, I feel like I’ll follow the league just as much, if not more, after my closest tie to the league leaves for pastures anew in January. In short, I owe an apology to MLS and it’s fans. You’re better than I could have ever imagined, and I’m sorry I’ve neglected you the last few years. Congratulations for making it this far, and here’s hoping we can enjoy the future of the sport in this country together for a long time to come. That game sounds like an awesome experience. 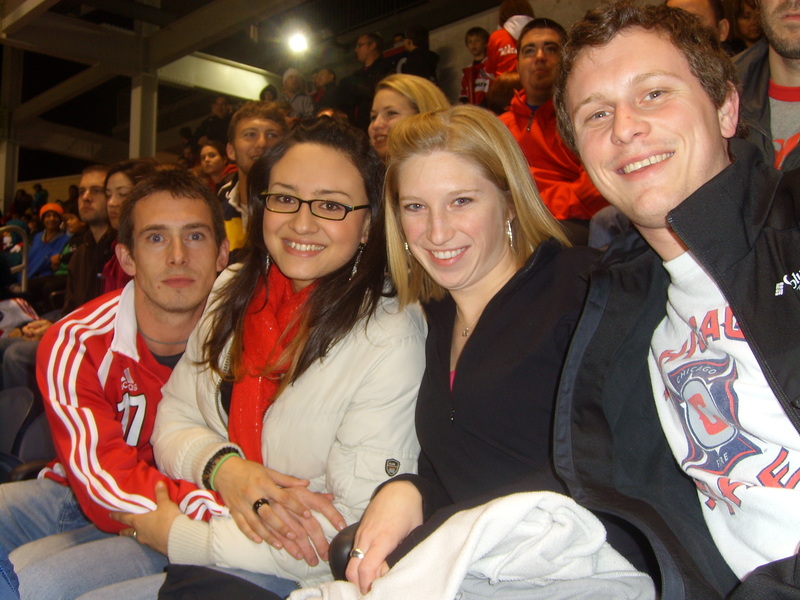 I caught a Fire game at Toyota Park last year, and I was also surprised by the intense level of support they had. Wish I had known about your boy Rolfe then, I would have been way more invested in the game! …now write an article about Thierry’s handball!